Glass Button Maker helps to create neat looking glass-like buttons for your applications or websites. 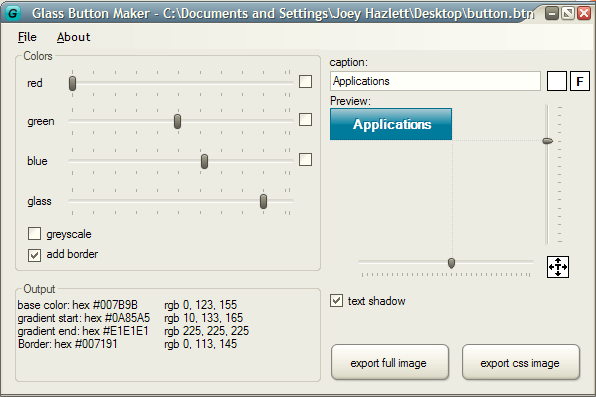 It is a very simple application that allows you to create colorful or greyscale glass buttons. It also displays the colors you choose in both RGB and hex values for use in your CSS/HTML when creating matching layouts. Glass Button Maker requires the the Microsoft .NET 2.0 framework installed on your system. You can download it from Microsoft’s website, or through Windows Updates. For Linux hosts, you will need Wine with Mono. What do you think about Glass Button Maker? Rate it!